(Ottawa ON – March 20, 2017) The Justice for Abdirhaman Coalition (Coalition) is demanding answers from the Attorney General of Ontario, Yasir Naqvi, following the preferential treatment of Constable Daniel Montsion. On March 6, 2017, the Director of the Special Investigations Unit, caused charges to be laid against Constable Daniel Montsion for manslaughter, aggravated assault, and assault with a weapon. While the facts have not yet been established in the court of law, it is the Coalition’s view that Constable Montsion is responsible for the death of Abdirahman Abdi. 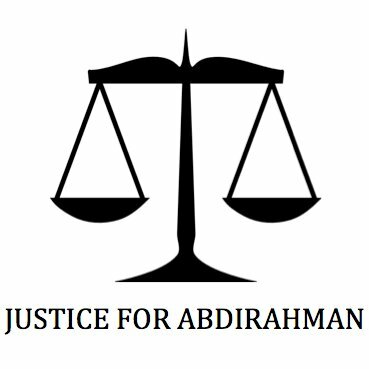 The Coalition has been at the forefront in the calls for transparency, accountability, and justice in this case since Abdirahman’s death. Montsion was scheduled to appear in court on March 6, 2017, but was deemed a “no-show” for his bail hearing. This situation led to mass confusion and criticism concerning the treatment Montsion was afforded. Over the last week, there have been discussion and media attention concerning the special treatment afforded to Montsion by the authorities, including being released from the police station, and his failing to appear for a bail hearing, in connection with charges of manslaughter. Since August 2016, the Coalition has been working to seek answers concerning Mr. Abdi’s death and also engaged in discussions with various authorities, at both the municipal and provincial level, with the aim of addressing numerous community concerns that have only been exacerbated by the killing of Mr. Abdi. “We are deeply troubled by this inconsistency in the application of justice and are even more concerned by the impact this has on the level of trust between the community and law enforcement” said Hamid Ibrahim, Co-Chair of the Coalition. Legal experts have noted that Montsion’s release prior to a court hearing is unprecedented for homicide charges. Technicalities aside, this act represents a further breach in trust in an already tense situation. It demonstrates a level of indifference to the pain and sorrow felt by the community, and confirms their worst suspicions about the inherent biases embedded in our law enforcement institutions. Despite several attempts by media outlets to clarify facts, there is still no clear answer as to who authorized Montsion’s release. Moreover, the silence of the Attorney General of Ontario in this regard is very concerning. This leads us to wonder if he condones the decision. “It is disturbing that the very institution mandated to prosecute in this case is turning a blind eye to preferential treatment being afforded to an officer charged with manslaughter” said the Chair of the Coalition. The obstruction of facts and shroud of secrecy around the details of his release are extremely concerning. “The simple fact that there was no straight answer for basic questions like ‘who authorized his release, from where and when’ is disappointing and unacceptable”, adds Ahmed. If police are not above the law, why was this officer, who was charged with serious crimes, granted preferential treatment through his release before a bail hearing? Why hasn’t the Attorney General of Ontario been forthcoming with information concerning Montsion’s release? How will the Attorney General of Ontario ensure the integrity of process in this case going forward? Unbelievable that Montsion was released before the bail hearing. That should be comtempt of the Court by the Ottawa police.